For other people named Quincy Jones, see Quincy Jones (disambiguation). Quincy Delight Jones Jr. was born on the South Side of Chicago on March 14, 1933, the son of Sarah Frances (née Wells), a bank officer and apartment complex manager, and Quincy Delight Jones Sr., a semi-professional baseball player and carpenter from Kentucky. Jones' paternal grandmother was an ex-slave in Louisville, and Jones would later discover that his paternal grandfather was Welsh. With the help of the author Alex Haley in 1972 and Mormon researchers in Salt Lake City, Jones discovered that his mother's ancestors included James Lanier, a relative of poet Sidney Lanier. Jones said, "He had a baby with my great-grandmother [a slave], and my grandmother was born there [on a plantation in Kentucky]. We traced this all the way back to the Laniers, the same family as Tennessee Williams." Learning that the Lanier immigrant ancestors were French Huguenots who had court musicians among their ancestors, Jones attributed some of his musicianship to them. For the 2006 PBS television program African American Lives, Jones had his DNA tested, and genealogists researched his family history again. His DNA revealed he is mostly African but is also 34% European in ancestry, on both sides of his family. Research showed that he has English, French, Italian, and Welsh ancestry through his father. His mother's side is of West and Central African descent, specifically the Tikar people of Cameroon. His mother also had European ancestry, such as Lanier male ancestors who fought for the Confederacy, making him eligible for Sons of Confederate Veterans. Among his ancestors is Betty Washington Lewis, a sister of president George Washington. Jones is also a direct descendant of Edward I of England, whose ancestors included French, Polish, Rurik, and Swiss nobility. Jones' family moved to Chicago as part of the Great Migration. Jones had a younger brother, Lloyd, who became an engineer for the Seattle television station KOMO-TV and died in 1998. Jones was introduced to music by his mother, who always sang religious songs, and by his next-door neighbor, Lucy Jackson. When Jones was five or six, Jackson played stride piano next door, and he would listen through the walls. Lucy recalled that after he heard her one day, she could not get him off her piano. When Jones was young, his mother suffered from a schizophrenic breakdown and was admitted to a mental institution. His father divorced his mother and married Elvera Jones, who already had three children of her own named Waymond, Theresa, and Katherine. Elvera and Quincy Sr. later had three children together: Jeanette, Margie, and future U.S. District Judge Richard. In 1943, Jones and his family moved to Bremerton, Washington, where his father got a wartime job at the Puget Sound Naval Shipyard. After the war, the family moved to Seattle, where Jones attended Garfield High School. In high school, he developed his skills as a trumpeter and arranger. His classmates included Charles Taylor, who played saxophone and whose mother, Evelyn Bundy, was one of Seattle's first society jazz band leaders. Jones and Taylor began playing music together, and at the age of 14 they played with a National Reserve band. Jones has said he got much more experience with music growing up in a smaller city because he otherwise would have faced too much competition. At age 14, Jones introduced himself to 16-year-old Ray Charles after watching him play at the Black Elks Club. Jones cites Charles as an early inspiration for his own music career, noting that Charles overcame a disability (blindness) to achieve his musical goals. He has credited his father's sturdy work ethic with giving him the means to proceed and his loving strength with holding the family together. Jones has said his father had a rhyming motto: "Once a task is just begun, never leave until it's done. Be the labor great or small, do it well or not at all." In 1951, Jones earned a scholarship to Seattle University, where a young Clint Eastwood—also a music major—watched him play in the college band. After one semester, Jones transferred to what is now the Berklee College of Music in Boston on another scholarship. While studying at Berklee, he played at Izzy Ort's Bar & Grille with Bunny Campbell and Preston Sandiford, whom he cited as important musical influences. He left his studies after receiving an offer to tour as a trumpeter, arranger, and pianist with the bandleader Lionel Hampton and embarked on his professional career. On the road with Hampton, he displayed a gift for arranging songs. He moved to New York City, where he received freelance commissions writing arrangements for Sarah Vaughan, Dinah Washington, Count Basie, Duke Ellington, Gene Krupa, and Ray Charles, who was by then a close friend. In early 1956, Jones accepted a temporary job at the CBS Stage Show hosted by Jimmy and Tommy Dorsey that was broadcast live from the Studio 50 in New York City. On January 28, February 4, 11 and 18, as well as on March 17 and 24, Jones played second trumpet in the studio band that supported 21-year-old Elvis Presley in his first six television appearances. Presley sang "Heartbreak Hotel", which became his first No. 1 record and the Billboard magazine Pop Record of the year. Soon after, as trumpeter and musical director for Dizzy Gillespie, Jones went on tour of the Middle East and South America sponsored by the United States Information Agency. After returning, he signed a contract with ABC-Paramount and started his recording career as the leader of his band. In 1957 he settled in Paris, where he studied composition and theory with Nadia Boulanger and Olivier Messiaen and performed at the Paris Olympia. He became music director at Barclay, a French record company and the licensee for Mercury in France. During the 1950s, Jones toured Europe with a number of jazz orchestras. As musical director of Harold Arlen's jazz musical Free and Easy, he took to the road again. A European tour closed in Paris in February 1960. With musicians from the Arlen show, he formed his big band "The Jones Boys" with eighteen musicians. The band included double bass player Eddie Jones and trumpeter Reunald Jones. The band toured North America and Europe and the concerts met enthusiastic audiences and sparkling reviews, but the earnings failed to support a band of this size. Poor budget planning resulted in an economic disaster; the band dissolved, leaving Jones in a financial crisis. "We had the best jazz band on the planet, and yet we were literally starving. That's when I discovered that there was music, and there was the music business. If I were to survive, I would have to learn the difference between the two." Irving Green, head of Mercury, helped Jones with a personal loan and a job as musical director of the company's New York division. He worked with Doug Moody, founder of Mystic Records. In 1961, Jones was promoted to vice-president of Mercury, becoming the first African American to hold the position. During the same year, at the invitation of director Sidney Lumet, he composed music for The Pawnbroker (1964). It was the first of his nearly 40 major motion picture scores. Following the success of The Pawnbroker, Jones left Mercury and moved to Los Angeles. After composing film scores for Mirage and The Slender Thread in 1965, he was in constant demand as a composer. His film credits over the next seven years included Walk, Don't Run, The Deadly Affair, In Cold Blood, In the Heat of the Night, Mackenna's Gold, The Italian Job, Bob & Carol & Ted & Alice, Cactus Flower, The Out-Of-Towners, They Call Me MISTER Tibbs!, The Anderson Tapes, $ (Dollars), and The Getaway. In addition, he composed "The Streetbeater", Niz Chicoloco, which became the theme music for the television sitcom Sanford and Son, starring his close friend Redd Foxx, and the themes for other TV shows, including Ironside, Banacek, The Bill Cosby Show, the opening episode of Roots, Mad TV and the game show Now You See It. In the 1960s, Jones worked as an arranger for Billy Eckstine, Ella Fitzgerald, Shirley Horn, Peggy Lee, Nana Mouskouri, Frank Sinatra, Sarah Vaughan, and Dinah Washington. His solo recordings included Walking in Space, Gula Matari, Smackwater Jack, You've Got It Bad Girl, Body Heat, Mellow Madness, and I Heard That!! Jones produced all four million-selling singles for Lesley Gore during the early and mid-sixties, including "It's My Party" (UK No. 8; US No. 1), its sequel "Judy's Turn to Cry" (US No. 5), "She's a Fool" (also a US No. 5) in 1963, and "You Don't Own Me" (US No. 2 for four weeks in 1964). He continued to produce for Gore until 1966, including the Greenwich/ Barry hits "Look of Love" (US No. 27 in 1965) and "Maybe I Know" (UK No. 20; US No. 14 in 1964). In 1975, he founded Qwest Productions for which he arranged and produced successful albums by Frank Sinatra and others. In 1978, he produced the soundtrack for The Wiz, the musical adaptation of The Wizard of Oz which starred Michael Jackson and Diana Ross. In 1982, he produced Jackson's, Thriller, the bestselling album in the history of the music industry. His 1981 album The Dude yielded the hits "Ai No Corrida" (a remake of a song by Chaz Jankel), "Just Once", and "One Hundred Ways", both sung by James Ingram. Jones and Thomas Newman are the only composers besides John Williams to have written scores for a Spielberg theatrical film. Spielberg directed a segment of Twilight Zone: The Movie that was scored by Jerry Goldsmith. Marking Jones's debut as a film producer, The Color Purple received 11 Oscar nominations that year. Additionally, through this picture, Jones is credited with introducing Whoopi Goldberg and Oprah Winfrey to film audiences around the world. After the 1985 American Music Awards ceremony, Jones used his influence to draw most of the major American recording artists of the day into a studio to record the song "We Are the World" to raise money for the victims of famine in Ethiopia. When people marveled at his ability to make the collaboration work, Jones explained that he had taped a sign on the entrance reading, "Check Your Ego at the Door". He was also quoted as saying, "We don't want to make a hunger record in tuxedos", requiring all participants to wear casual clothing in the studio. In 1990, Quincy Jones Productions joined with Time Warner to create Quincy Jones Entertainment. The company signed a 10-picture deal with Warner Brothers and a two-series deal with NBC Productions. The television show The Fresh Prince of Bel-Air was completed in 1990, but producers of In the House (from UPN) rejected its early concept stages. Jones produced the successful The Fresh Prince of Bel-Air (discovering Will Smith), UPN's In the House, and FOX's Madtv – which ran for 14 seasons. In the early 1990s, he started a huge, ongoing project called "The Evolution of Black Music". QJE started a weekly talk show with Jones's friend the Reverend Jesse Jackson as the host. Beginning in the late 1970s, Jones tried to convince Miles Davis to revive the music he had recorded on several classic albums of the 1960s which had been arranged by Gil Evans. Davis had always refused, citing a desire to avoiding revisiting the past. But in 1991 Davis relented. Despite having pneumonia, he agreed to perform the music at the Montreux Jazz Festival. The recording, Miles & Quincy Live at Montreux, was his last album; he died several months afterward. In 1993, Jones collaborated with David Salzman to produce the concert An American Reunion, a celebration of Bill Clinton's inauguration as president of the United States. During the same year, he and Salzman renamed his company Quincy Jones/David Salzman Entertainment. 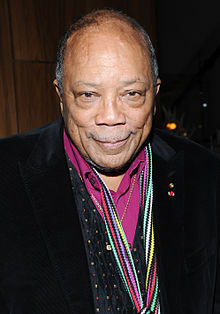 In 2001, Jones published his autobiography, Q: The Autobiography of Quincy Jones. On July 31, 2007, he partnered with Wizzard Media to start the Quincy Jones Video Podcast. In each episode, he shares his knowledge and experience in the music industry. The first episode features him in the studio producing "I Knew I Loved You" for Celine Dion. This is included on the Ennio Morricone tribute album, We All Love Ennio Morricone. Jones helped produce Anita Hall's 2009 album Send Love. In 2013 he produced Emily Bear's album Diversity. After that, he produced albums for Grace, Justin Kauflin, Alfredo Rodríguez, Andreas Varady, Nikki Yanofsky. He also became a mentor of Jacob Collier. In 2017, Jones and French producer Reza Ackbaraly started Qwest TV, the world's first subscription video-on-demand (SVOD) service for jazz and eclectic music from around the world. The platform features a handpicked selection of ad-free concerts, interviews, documentaries, and exclusive, original content, all in HD or 4K. In 2010, Jones, along with brand strategist Chris Vance, co-founded Playground Sessions, a NY City-based developer of subscription software that teaches people to play the piano using interactive videos. Pianists Harry Connick Jr. and David Sides are among the company's video instructors. Jones worked with Vance and Sides to develop the video lessons and incorporate techniques to modernize the instruction format. While working on the film The Wiz, Michael Jackson asked Jones to recommend some producers for his upcoming solo album. Jones offered some names but eventually offered to produce the record himself. Jackson accepted and the resulting record, Off the Wall, sold about 20 million copies. This made Jones the most powerful record producer in the industry at that time. Jones and Jackson's next collaboration, Thriller, sold 110 million copies and became the highest-selling album of all time. The rise of MTV and the advent of music videos as promotional tools also contributed to Thriller's sales. 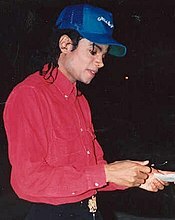 Jones worked on Jackson's album Bad, which has sold 45 million copies. Bad was the last time the two men worked together in the studio. Audio interviews with Jones are included in the 2001 special editions of Off the Wall, Thriller, and Bad. In a 2002 interview, when asked if he would work with Jones again, Jackson suggested he might. But in 2007, when Jones was asked by NME, he said, "Man, please! We already did that. I have talked to him about working with him again but I've got too much to do. I've got 900 products, I'm 74 years old." I am absolutely devastated at this tragic and unexpected news. For Michael to be taken away from us so suddenly at such a young age, I just don't have the words. Divinity brought our souls together on The Wiz and allowed us to do what we were able to throughout the '80s. To this day, the music we created together on Off the Wall, Thriller and Bad is played in every corner of the world and the reason for that is because he had it all ... talent, grace, professionalism and dedication. He was the consummate entertainer and his contributions and legacy will be felt upon the world forever. I've lost my little brother today, and part of my soul has gone with him. In October 2013, the BBC and The Hollywood Reporter said Jones planned to sue Michael Jackson's estate for $10 million. Jones said that MJJ Productions, a song company managed by Jackson's estate and Sony Music Entertainment, improperly re-edited songs to deprive him of royalties and production fees and breached an agreement giving him the right to remix master recordings for albums released after Jackson's death. The songs Jones produced for Jackson were used in the film This Is It. Jones was reported to be filing the suits against Michael Jackson Cirque du Soleil productions and the 25th-anniversary edition of the Bad album. He believed he should have received a producer credit in the film. The Brazilian Simone, whom Jones cites as "one of the world's greatest singers"; Brazilian musicians Ivan Lins and Milton Nascimento; and percussionist Paulinho Da Costa, who Jones called "one of the best in the business", have become close friends and partners in his recent works. American astronaut Leland D. Melvin and Pharrell Williams present a NASA montage to Jones. Jones had a brief appearance in the 1990 video for The Time song "Jerk Out". Jones was a guest actor on an episode of The Boondocks. He appeared with Ray Charles in the music video of their song "One Mint Julep" and also with Ray Charles and Chaka Khan in the music video of their song "I'll Be Good to You". Jones hosted an episode of the long-running NBC sketch comedy show Saturday Night Live on February 10, 1990 (during SNL's 15th season). The episode was notable for having 10 musical guests (the most any SNL episode has had in its 40 plus years on the air): Tevin Campbell, Andrae Crouch, Sandra Crouch, rappers Kool Moe Dee and Big Daddy Kane, Melle Mel, Quincy D III, Siedah Garrett, Al Jarreau, and Take 6, and for a performance of Dizzy Gillespie's "Manteca" by The SNL Band (conducted by Quincy Jones). 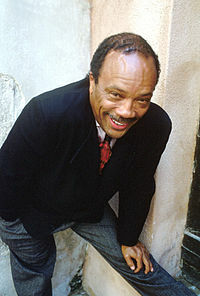 Jones impersonated Marion Barry, former mayor of Washington, DC, in the recurring sketch The Bob Waltman Special. He later produced his own sketch comedy show, FOX's MADtv, which ran from 1995 to 2009. Jones appeared in the Walt Disney Pictures film Fantasia 2000, introducing the set piece of George Gershwin's Rhapsody in Blue. Two years later he made a cameo appearance as himself in the film Austin Powers in Goldmember. On February 10, 2008, Jones joined Usher in presenting the Grammy Award for Album of the Year to Herbie Hancock. On January 6, 2009, he appeared on NBC's Last Call with Carson Daly to discuss his career. Daly informally floated the idea that Jones should become the first minister of culture for the United States, pending the inauguration of Barack Obama as president. Daly noted that only the US and Germany, among leading world countries, did not have a cabinet-level position for this role. Commentators on NPR and in the Chronicle of Higher Education have also discussed the topic of a minister of culture. In February 2014, Jones appeared in Keep on Keepin' On, a documentary about his friend, Clark Terry, the jazz trumpeter and flugelhorn player. In the film, Terry introduces Jones to his protege, Justin Kauflin, whom Jones then signs to his band and label. In July 2014, Jones starred in a documentary film, The Distortion of Sound. In September 2015, he was a guest on Dr. Dre's The Pharmacy on Beats 1 Radio. He was also featured on Jacob Collier's YouTube cover of Michael Jackson's "P.Y.T. (Pretty Young Thing)". On February 28, 2016, he and Pharell Williams presented Ennio Morricone with the Oscar for best film score. and in August 2016, he and his music were featured at the BBC Proms at the Royal Albert Hall,l London. Jones's social activism began in the 1960s with his support of Martin Luther King Jr. Jones is one of the founders of the Institute for Black American Music (IBAM), whose events aim to raise enough funds for the creation of a national library of African-American art and music. Jones is also one of the founders of the Black Arts Festival in his hometown of Chicago. In the 1970s Jones formed The Quincy Jones Workshops. Meeting at the Los Angeles Landmark Variety Arts Center, the workshops educated and honed the skills of inner-city youth in musicianship, acting, and songwriting. Among its alumni were Alton McClain who had a hit song with Alton McClain and Destiny, and Mark Wilkins, who co-wrote the hit song "Havin' a Love Attack" with Mandrill and became National Promotion Director for Mystic Records. For many years, Jones has worked closely with Bono of U2 on a number of philanthropic endeavors. He is the founder of the Quincy Jones Listen Up Foundation, a nonprofit organization that built more than 100 homes in South Africa and which aims to connect youths with technology, education, culture, and music. One of the organization's programs is an intercultural exchange between underprivileged youths from Los Angeles and South Africa. In 2004, Jones helped launch the We Are the Future (WAF) project, which gives children in poor and conflict-ridden areas a chance to live their childhoods and develop a sense of hope. The program is the result of a strategic partnership between the Global Forum, the Quincy Jones Listen Up Foundation, and Hani Masri, with the support of the World Bank, UN agencies and major companies. The project was launched with a concert in Rome, Italy, in front of an audience of half a million people. Jones supports a number of other charities, including the NAACP, GLAAD, Peace Games, AmfAR, and the Maybach Foundation. He serves on the Advisory Board of HealthCorps. On July 26, 2007, he announced his endorsement of Hillary Clinton for president. But with the election of Barack Obama, Quincy Jones said that his next conversation "with President Obama [will be] to beg for a secretary of arts." This prompted the circulation of a petition on the internet asking Obama to create such a Cabinet-level position in his administration. In 2001, Jones became an honorary member of the board of directors of the Jazz Foundation of America. He has worked with the foundation to save the homes and lives of America's elderly jazz and blues musicians, including those who survived Hurricane Katrina. Jones and his friend John Sie, founder of Liberty Starz, started the Global Down Syndrome Foundation. They were inspired by Sie's granddaughter, Sophia, who has Down syndrome. Jones has been married three times and has seven children with five different women. He was married to Jeri Caldwell from 1957 to 1966, and they had one daughter named Jolie. He had a brief affair with Carol Reynolds, and they had a daughter named Rachel. He was later married to Swedish actress Ulla Andersson from 1967 to 1974, and they had a daughter named Martina and a son named Quincy, who also became a music producer. Jones was married to American actress Peggy Lipton from 1974 to 1990, and they had two daughters named Kidada and Rashida, both of whom became actresses. He later dated and lived with German actress Nastassja Kinski from 1991 to 1995, and they had a daughter named Kenya, who became a fashion model. In 1994, rapper Tupac Shakur criticized Jones for having relationships with white women, prompting Jones' daughter Rashida to pen a scathing open letter in response, which was published in The Source. Rashida's sister Kidada developed a romantic relationship with Shakur and had been living with the rapper for four months at the time of his death. Jones never learned to drive, citing his involvement in a car crash at age 14 as the reason. He is a believer in astrology. In regard to religion, he stated in February 2018 that he believes in a God that opposes the love of money but dismisses the notion of an afterlife; he holds a negative opinion of the Catholic Church, believing it is built upon the notions of money and "fear, smoke, and murder". He also claimed to have knowledge of the truth of the Kennedy assassination, stating his belief that mobster Sam Giancana was responsible, as well as outing sexual relationships Marlon Brando had with James Baldwin, Richard Pryor, and Marvin Gaye. In the same interview, Jones stated he dated Ivanka Trump despite expressing disdain for her father. He later apologized for the interview after a family intervention with his six daughters, blaming the things he said on "word vomit". In 1974, Jones suffered a life-threatening brain aneurysm, so he decided to cut back on his schedule to spend time with his friends and family. Since his family and friends believed Jones' life was coming to an end, they started to plan a memorial service for him. He attended his own service with his neurologist by his side, in case the excitement overwhelmed him. Some of the entertainers at his service were Richard Pryor, Marvin Gaye, Sarah Vaughan, and Sidney Poitier. He received the Grammy Legend Award in 1992, one of only 15 people ever to receive it. He is second in the list of all-time Grammy award wins. He has more Grammy Award nominations than any other artist. Garfield High School in Seattle named a performing arts center after him. Quincy Jones Elementary School located in South Central Los Angeles is named after him. He received the Humanitarian Award at the BET Awards in 2008. He received the John F. Kennedy Center Honors in 2001. He received the Los Angeles Press Club Visionary Award in 2014. He received an honorary doctorate from the Royal Academy of Music, London, in 2015. He was inducted into the Rock and Roll Hall of Fame in 2013, winning the Ahmet Ertegun Award. ^ a b "Quincy Jones". Retrieved September 27, 2014. ^ a b Callaway, Sue (January 28, 2007). "Fortune test drives a Mercedes Maybach with Quincy Jones – February 5, 2007". CNN. Retrieved July 18, 2009. ^ a b "Quincy Jones social activism". Biography.com. Retrieved May 19, 2016. ^ Busis, Hillary. "Public Enemy, Rush, Heart, Donna Summer to be inducted into Rock and Roll Hall of Fame | The Music Mix | EW.com". Music-mix.ew.com. Retrieved December 13, 2012. ^ a b c d e f g h i "Quincy Jones Interview". Academy of Achievement. Archived from the original on March 20, 2012. Retrieved March 31, 2012. ^ "Quincy Jones Biography (1933–)". Filmreference.com. Retrieved July 18, 2009. ^ "Quincy Jones on his Welsh roots". BBC. July 4, 2009. Retrieved April 27, 2012. ^ "New DNA test results trace Oprah Winfrey's ancestry to Liberia/Zambia". Zambia News. February 6, 2006. Archived from the original on July 18, 2011. ^ "Some Notes on Quincy Jones's Roots". Genealogy Magazine. March 14, 1993. Archived from the original on October 23, 2012. Retrieved March 31, 2012. ^ "Michelle's Great-great-great-granddaddy and Yours?". The root. Archived from the original on February 9, 2013. Retrieved September 27, 2014. ^ "Quincy Jones: The Story of an American Musician". Pbs.org. Retrieved September 27, 2014. ^ a b c d e f g "Paul De Barros, "From his Great Depression childhood in Seattle, Quincy Jones dared to dream"". Catholic.org. Archived from the original on October 29, 2013. Retrieved September 27, 2014. ^ Brunner, Jim (March 25, 2007). "Federal bench nominee Jones wins high praise from both parties". The Seattle Times. Retrieved July 16, 2011. ^ "Quincy Jones: Seattle's Own Music Man". Northwest Prime Time. September 1, 2013. Retrieved July 8, 2014. ^ Feist, Jonathan (1999). Masters of Music: Conversations with Berklee Greats. Berklee Press. p. 177. ISBN 9780634006425. ^ Gleason, Ralph J. (2016). Conversations in Jazz: The Ralph J. Gleason Interviews. Yale University Press. pp. 20–. ISBN 978-0-300-21452-9. Retrieved November 17, 2018. ^ Jones, Quincy (April 23, 2002). Q: The Autobiography of Quincy Jones. Crown/Archetype. pp. 135–. ISBN 978-0-385-48896-9. Retrieved November 17, 2018. ^ Rear cover of 1998 CD reissue of Big Band Bossa Nova. ^ "Quincy Jones". Biography.com. Retrieved September 27, 2014. ^ Kastrenakes, Jacob (March 18, 2015). "John Williams won't score a Steven Spielberg film for the first time in 30 years". The Verge. Retrieved August 24, 2016. ^ Ebert, Roger (June 24, 1983). "Twilight Zone – The Movie". Roger Ebert. Retrieved August 24, 2016. ^ "Twilight Zone: The Movie (1983)". Screen Archives. Retrieved August 24, 2016. ^ a b "Home - Quincy Jones". Quincy Jones. Retrieved June 12, 2018. ^ "A Week of No Sleep". davidbreskin.com. Retrieved February 18, 2018. ^ "About". Quincy Jones. Archived from the original on July 14, 2014. Retrieved May 23, 2014. ^ "Quincy Jones". Notablebiographies.com. Retrieved September 27, 2014. ^ Thigpen, David E. (October 4, 1993). "The Last Great Set". TIME. Retrieved December 13, 2012. ^ "Quincy Jones". quincyjones.com. August 25, 2008. Retrieved July 18, 2009. ^ "Quincy Jones is still at the forefront of music tech with his piano learning startup Playground Sessions". pando.com. April 19, 2013. Retrieved March 20, 2019. ^ "Quincy Jones Evolves Music Education With Playground Sessions". hollywoodreporter.com. April 18, 2013. Retrieved March 20, 2019. ^ "BBC China | Michael Jackson Photo Gallery". Bbc.co.uk. Retrieved August 17, 2011. ^ Adam Bychawski (May 25, 2007). "Quincy Jones snubs chance to team up with Michael Jackson". NME. UK. Retrieved July 18, 2009. ^ James, Frank (June 25, 2009). "Michael Jackson Dead at 50". The Two-Way. NPR. Retrieved December 9, 2010. ^ a b Miriam Coleman (October 26, 2013). "Quincy Jones Sues Michael Jackson Estate". Rolling Stone. Retrieved September 27, 2014. ^ Gardner, Eriq (October 25, 2013). "Quincy Jones Files $10M Lawsuit Over Michael Jackson Music (Exclusive)". The Hollywood Reporter. ^ "Quincy Jones Sues Michael Jackson's Estate". ABC News. Retrieved September 27, 2014. ^ "US music producer Quincy Jones sues Jackson estate". BBC News. October 26, 2013. Retrieved May 23, 2014. ^ Live and Swingin': The Ultimate Rat Pack Collection, Reprise R2 73922, 2003 (CD & DVD). ^ video tape Frank Sinatra. Good Times Home Video, No. 05-09845. One of a set of five tapes. 1999? ^ on the VHS tape Frank Sinatra: Portrait of an Artist, MGM/UA Video, 1985, MV400648. ^ Elfmanlas, Doug (April 13, 2013). "Quincy Jones shares stories of old Vegas". Reviewjournal.com. Retrieved December 28, 2015. ^ "AllBrazilianMusic, Ivan Lins from A to Z". Allbrazilianmusic.com. October 18, 2000. Archived from the original on August 6, 2007. Retrieved July 18, 2009. ^ Q: The Autobiography of Quincy Jones, p. 233. ^ a b "Saturday Night Live: Quincy Jones Episode Trivia". TV.com. Retrieved July 18, 2009. ^ Blair, Elizabeth (January 16, 2009). "Does U.S. Need A Culture Czar?". NPR. Retrieved July 18, 2009. ^ "Brainstorm: Do We Need a U.S. Minister of Culture?". Chronicle.com. January 15, 2009. Retrieved July 18, 2009. ^ "The Distortion of sound". Distortionofsound.com. Archived from the original on September 30, 2014. Retrieved September 27, 2014. ^ Bakare, Lanre (February 29, 2016). "Quincy Jones avoids #OscarsSoWhite controversy in Academy Awards speech" – via The Guardian. ^ Fordham, John (August 23, 2016). "Quincy Jones Prom review – heartfelt tribute to a great musician's extraordinary legacy" – via The Guardian. ^ "Interview with Author – Mark Wilkins". Interviews With Writers. July 4, 2016. Retrieved January 25, 2018. ^ "Quincy Jones Biography". Biography.com. Retrieved May 23, 2014. ^ "UN-HABITAT.:. Eritrea - Activities - We are the Future Centres". mirror.unhabitat.org. ^ "Maybach Family Foundation". Webcitation.org. Archived from the original on January 5, 2009. Retrieved May 23, 2014. ^ Perry, Suzanne (November 26, 2008). "Online Petition Asks Obama to Create Secretary of the Arts Position". The Chronicle of Philanthropy. Retrieved December 13, 2012. ^ Nikki Finke (January 10, 2009). "Should US have a Minister of the Arts". Deadline Hollywood Daily. Retrieved July 18, 2009. ^ Ebsen, William Amarteifio (June 11, 2013). Humanity and the Nature of Man. AuthorHouse. pp. 122–. ISBN 978-1-4817-9793-1. Retrieved August 17, 2018. ^ "Global Down Syndrome Foundation". Global Down Syndrome Foundation. Retrieved February 18, 2018. ^ "Ability Magazine: Quincy Jones Interview with Chet Cooper" (2011)". Retrieved April 3, 2012. ^ "Quincy Jones". Yahoo! Movies. ^ a b Izadi, Elahe (September 13, 2016). "'Tupac was the love of my life': Kidada Jones on her relationship with the slain rapper". The Washington Post. Retrieved January 25, 2017. ^ Callaway, Sue (February 5, 2007) [January 28, 2007]. "Fortune test drives a Mercedes Maybach with Quincy Jones". CNN Money. Retrieved July 18, 2009. ^ Marchese, David (February 7, 2018). "In Conversation: Quincy Jones". Vulture. ^ Fisher, Luchina (February 22, 2018). "Quincy Jones apologizes for the 'silly things' he said in recent interviews". ABC News. Retrieved April 5, 2018. ^ "Quincy Jones". AllMusic. Retrieved September 27, 2014. ^ "5 Things You Didn't Know about Quincy Jones". Mental Floss. Retrieved September 27, 2014. ^ "Grammy Legend Award". grammy.com. Retrieved September 20, 2017. ^ Bryson Taylor, Derrick. "Obama Honors Quincy Jones With Arts Medal" Article in Essence.com, 2010. Retrieved on March 31, 2019. ^ "Music Legend Quincy Jones to Receive the Visionary Award". LA Press Club. September 22, 2014. Retrieved December 28, 2015. ^ "Honorary Doctorate for Quincy Jones – Royal Academy of Music". Ram.ac.uk. Retrieved December 28, 2015. "Quincy Jones". Archive of American Television. Video interview. "Quincy Jones". Mix Magazine Online. Archived from the original on May 2, 2009. "Quincy Jones: The Story of an American Musician". American Masters. PBS. "Quincy Jones Speech at Beijing University" (PDF). USC Public Diplomacy. Beijing, China. Archived from the original (PDF) on October 6, 2009. Wikimedia Commons has media related to Quincy Jones. "Quincy Jones". The MusiCodex. Archived from the original on August 26, 2014. "Quincy Jones". NAMM Oral History Library. 2014. "Quincy Jones: National Visionary (Excerpts)". The National Visionary Leadership Project.